Stunned family refutes declaration, citing signs of savage beating. LOS ANGELES, April 9, 2013 (Morning Star News) – Vietnamese officials are calling the death of a Christian in police custody a suicide – a claim family members of the severely beaten Christian strongly refute. 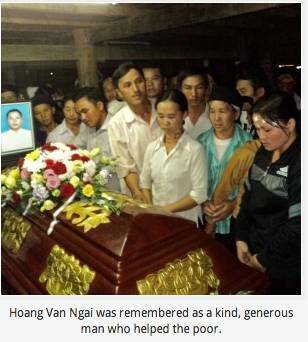 Hoang Van Ngai, previously identified by his Hmong name of Vam Ngaij Vaj, died on March 17 in custody in Gia Nghia, Dak Nong Province in Vietnam’s Central Highlands after police arrested him, his brother and their wives without any charges or legal documents (see Morning Star News, March 28). Ngai, a 38-year-old father of four who was a lay church leader, had angered some government officials by finding ways for the Bui Tre Church to keeping functioning, as the officials had forbidden it to meet from 2000 to 2003; he refused to pay expected bribes and otherwise “strongly resisted their abuse of power,” his brother Hoang Van Pa states in a report to government officials and church leaders. Ngai and Pa were arrested on March 15 after local police had tried to capture them the previous day as the two brothers cleared brush from newly purchased fields in Dak Ha Commune of Dak Glong District. While official charges against them were not made, some reports said they were accused of “destroying the forest” on their own land – which according to Pa has no trees, only some tree stumps. When Pa pleaded to go to help his brother, the guard mockingly told him Ngai only had a stomach ache. Vietnamese officials have tried to suppress information contained in Pa’s report, which states that on March 18 officers at the Gia Nghia police station gave a disturbing explanation to family members and friends, suggesting that he had purposely electrocuted himself by sticking his hand in an electrical socket. The BBC on March 24 broadcast a statement by the head of the Dak Nong Provincial Peoples’ Committee, Le Hien, repeating suicide as the cause of death. Family members strongly reject the possibility of suicide, pointing out that more than 300 witnesses who viewed Ngai’s body concurred with Pa’s report that it had “many bruises and contusions on his throat, back, and head, and deep cuts on his body and his skull smashed.” They were also incensed that an autopsy had been performed on Ngai’s body without their knowledge and consent. Family members further assert that Ngai, a building contractor, merchant and farmer whose four children range in age from 7 to 15, had absolutely no reason to commit suicide. Before his incarceration, Ngai was an exceptionally strong and healthy man. Pa states in his report that he was held in the interrogation cell of Deputy Police Chief Pham Duc Thinh, while Ngai was in the interrogation cell of Chief Investigator Tung. When he heard an “unusually loud racket from my brother Ngai’s cell,” including the sounds of many people and a savage beating, he became very worried, he said. According to Pa, the police officer who remarked that Ngai was probably dead had come running back from playing soccer and had headed straight to Ngai’s cell door. Many officers then arrived to carry Ngai down the hallway, Pa states. Pa said he cried out, asking police if he could accompany his brother, but an office guarding the door stopped him. Police and officials from Nghia Tin village had tried to arrest the two brothers on March 14 when they were working their field with their wives, but the men escaped. After capturing Ngai’s wife, Ly Thi Song, and his sister-in-law, Ly Thi My, the women were handcuffed, tied with rope and dragged to the police vehicle, and beaten with sticks along the way, according to Pa. They were taken to the police station in Gia Nghia and released on March 16. In a strong petition of protest dated March 29 and sent to the chief of police of Dak Nong Province, Ngai’s wife, brother and sister-in-law testify that they were all taken into custody without any charges or any legal documents. They protest that the women were beaten in custody and that they were prevented from helping Ngai after his cruel beating. They call on authorities to indict those responsible for these illegal actions. An ethnic Hmong from Bac Kan Province in Vietnam’s Northwest Mountainous Region, Ngai became a Christian in 1999 and migrated south to Vietnam’s Central Highlands, when thousands of Hmong Christians suffering heavy persecution were making this same journey. He and his extended family settled in Dak Nong Province. Ngai was an elder and leader of worship at the Bui Tre Church, which belongs to the legally recognized Evangelical Church of Vietnam (South). More than 600 people regularly attend services, including 230 children. Ngai helped build the attractive wooden building of the Bui Tre Church, which was erected against great odds and government harassment in 2006. 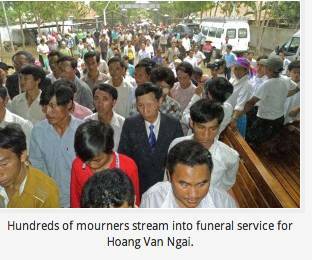 Ngai’s brother, Hoang van Qua, pastor of the Bui Tre church, said Ngai had special regard for the poor. An expert on Christianity in Vietnam said Ngai’s death was not only a great loss to his young family, church and community, but a gross injustice which should be a huge embarrassment to his country’s leaders. “But unless the precedent changes, sadly, those who beat him to death will go unpunished,” he said.